Inside Gaming: Macau revenue up in July; Charles Oakley avoids jail w/plea deal in casino fraud case. Macau gross gaming revenue up over 10 percent in July; closed Atlantic Club sold in Atlantic City. Happy Friday, all. This week's Inside Gaming starts with the latest numbers from Macau where gaming revenue is up, tells of the purchase of a shuttered casino in Atlantic City, notes conflict in the Philippines over casino expansion, and reports on the settling of a former NBA star's casino fraud case in Las Vegas. Last week the Macau Gaming Inspection and Coordination Bureau shared its "Monthly Gross Revenue from Games of Fortune" report for July to show casinos enjoyed a 10.3 percent revenue increase year-over-year. The just over 25.3 billion patacas (about $3.13 billion USD) of gross revenue realized by Macau casinos in July not only represented an increase over the almost 23 billion from July 2017, but a 12.6 percent jump from the almost 22.5 billion of revenue June. "We view this result favorably as the month faced three headwinds," commented Union Gaming Securities Asia Ltd analyst Grant Govertsen, as shared by GGRAsia. "The calendar was unfavorable with one fewer Sunday; July had the toughest comp of the year… and while we believe it was a small impact, the more interesting second half of the World Cup played out during the first two weeks of July." Some analysts had believed the FIFA World Cup lasting from mid-June to mid-July would actually have a "dampening effect" on Macau casino revenue and thus (as Govertsen explains) providing the possibility of a tough "comp" or comparative with July 2017. The 10.3 percent increase was essentially in line with analysts' predictions for July. 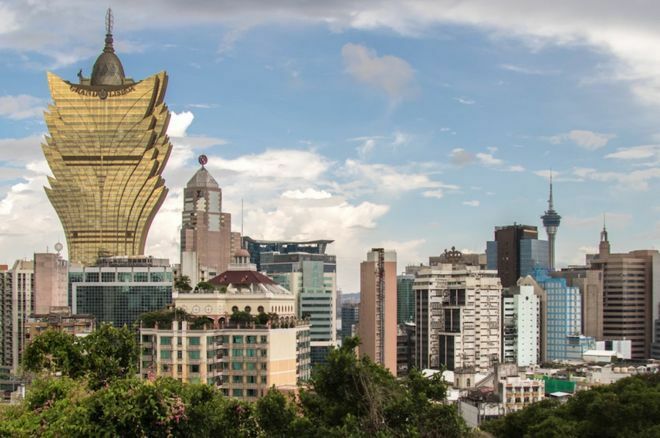 Looking ahead to August, Macau should show an even greater growth — 15 to 17 percent, say some — thanks in part to the negative effects of two typhoons in August 2017 that "took a bite out of GGR [gross gaming revenue] last year," Govertsen notes. This summer has seen two new hotel-casinos open in Atlantic City — the Hard Rock Atlantic City and Ocean Resort Casino — bringing the number of up-and-running properties on the Boardwalk to nine. Four-and-a-half years ago there had been 12 open before five of them closed, the first being the Atlantic Club Casino Hotel which shut its doors in January 2014. In the years since deals to purchase the property have fallen through, including most recently in March 2017 when an agreement with R & R Development Group was scuttled due to lack of financing. This week, however, owners TJM Properties have reached a new agreement with Stockton University whose main campus is in nearby Galloway, NJ. According to NJ.com, on Wednesday the school's board of trustees approved plans to purchase the property with an intention to use it for both academic and residential facilities. Details of the agreement have not been publicized, although the deal included TJM Properties overseeing the demolition of the 23-story hotel. TJM Properties bought the Atlantic Club from Caesars Entertainment after it had closed in 2014 for $13.5 million. The 1,100-space parking garage will remain, however, as Stockton University rebuilds on the 20-acre lot. The property will serve the university's new residential campus in Atlantic City which is due to open later this month in time for the fall semester. On the same day Chinese company Landing International Development broke ground on a new $1.5 billion integrated casino project in Manila, Philippines President Rodrigo Duterte delivered a speech decrying gambling and ordered a sudden freeze to the project, reports Reuters. After a speech in which the controversial leader declared "I hate gambling" and "There will be no casinos outside of what are existing... I am not granting anything," Duterte demanded a review of the contract that enabled Landing International Development to break ground. At the end of 2017, "there were nine private casino firms in the Philippines operating 1,444 gaming tables and 9,427 electronic gaming machines, according to government data." Gross gaming revunues totaled 176.5 billion pesos or about $3.3 billion USD last year. According to Duterte, the contract with Landing "put the government at a disadvantage because the rental payment was too cheap and the lease too long." Meanwhile Landing said Wednesday it was pushing through with its project as its lease contract is valid. You might have heard about former NBA star Charles Oakley getting into some trouble while playing Ultimate Texas Hold'em at The Cosmopolitan of Las Vegas early last month. On July 8 Oakley was arrested at the Cosmopolitan by Nevada Gaming Control Board enforcement agents "for committing — or attempting to commit - a fraudulent act in a gaming establishment." Suspected of "adding to or reducing his wager on a gambling game after the outcome was known," TMZ would later report that in one instance Oakley pulled back a $100 chip after realizing he was going to lose his wager, then on two other occasions added chips when he was dealt favorable hands in an attempt to increase his winnings. Oakley was charged with a felony that carried the potential for six years in prison. But this week Oakley's attorneys negotiated for Oakley to plead no contest to a misdemeanor charge of disorderly conduct and pay a $1,000 fine, thereby enabling him to avoid jail time. The 54-year-old Oakley played for six different teams during a 19-year career before retiring in 2004. Photo: "Macau City Panorama" (adapted), Andrew Moore, CC BY-SA 2.0. Unbelievable: Free Slots for a Month and 3x More Cash!